Whether you have school-aged children to make lunches for or you bring your own to work each day, everyone can benefit from healthy packed lunch ideas. When you bring your own lunch, you have the power to choose your ingredients and avoid the temptation to eat out with coworkers or force your kids to succumb to cafeteria food. Packing a healthy, balanced lunch each day leads to a healthier body and less unwanted pounds. With just a little prep the night before, you can feel proud of your healthy lunch and the goodness you’re giving your body. 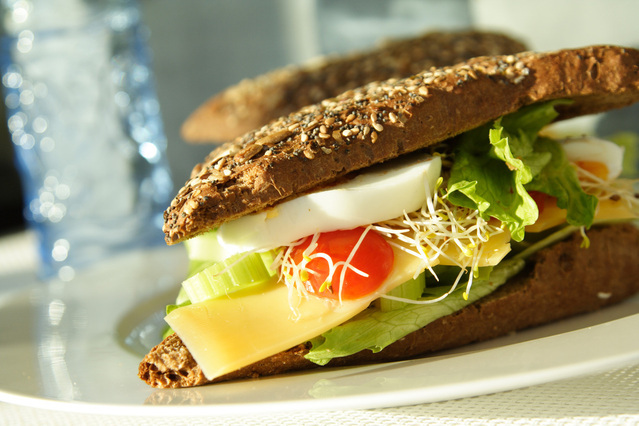 Whole grains are an important part of a healthy meal. They give you fiber and vitamins that make you feel full and satisfied. Be careful to check that any whole grain you pack is actually a whole grain. Several packaged products like bread, bagels, and pasta will claim to be whole grain but actually contain refined white flours as well. You could count half a bagel, 1/2 cup of cooked rice, a slice of bread, a cup of other whole grains, or 1/2 cup pasta as a serving of grains. Proteins are another largely important part of the diet. The problem is that Americans are eating way too much of unhealthy sources of protein. You want to include the healthy sources for proper nutrition, especially for kids and their growing bodies. One serving of protein could be 1/2 cup of cooked beans, one egg, 1/3 cup of nuts, or 2 to 3 ounces of meat. And be sure to LIMIT proteins with high saturated fat content, such as hot dogs, cheeses, bacons, and sausages. These are the types of proteins of which we eat way too much. Don’t skip these! If you have a picky child, try to find some veggies they like to begin with, and slowly work on incorporating more. If you’re not used to many veggies yourself, challenge yourself to increase your servings of them a little each week. Also, including a variety of veggies is a great idea because you’re getting a wide range of colors: oranges, purples, greens, reds, whites, yellows, blues, etc. Those colors aren’t just pretty to look at—they are caused by phytochemicals that are so beneficial to your body and your kids’ bodies. Try to include as many veggies as you can in your lunches. A serving is typically 1/2 cup of cooked veggies or a cup of raw. You saw this one coming, right? Because of their vitamins and minerals, vegetables and fruits are such an important part of a healthy diet, so be sure to include fresh fruit in your packed lunches. Notice that I said fresh fruit—not fruit that has been canned in syrup or dried and covered in sugar. And be mindful that fruit snacks don’t count as a serving of fruit! or slice them all up and make a mixed fruit salad! One serving of fruit equals whole fruit the size of a tennis ball, about 1/2 cup of cup of fresh fruit, or half a banana. Some people are really afraid of added fats in their diet, but the truth is some healthy fats are needed by the body—especially for children who are still growing. Limit the amount of animal fats you eat, but make sure you get enough from plant sources. And always stay away from any hydrogenated fats (found in a lot of packaged foods). A half cup of nuts, a tablespoon of nut butter, or 1/5 of an avocado counts as a serving of healthy fat. For additional healthy fat supplements, you can include a high-quality pharmaceutical-grade fish oil supplement like Mimi’s Omegas. Although it isn’t food, another important part of a healthy lunch is HYDRATION. Water is so important to the health of our bodies, so make sure you either include some water in your healthy lunch (and your kid’s lunch) or be sure to drink it throughout the day. And keep in mind that sodas, juices, and other sugar drinks do not count as hydrating sources—in fact, they are dehydrating. So drink your water and make sure your kids do too! Healthy eating should be a priority for those wanting to look and feel better. 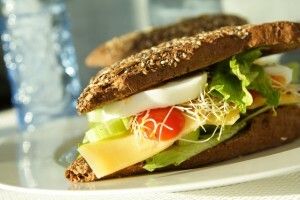 But unfortunately, our modern food processes leave even those who eat healthy with mineral deficiencies. To protect yourself fully, take an organic mineral supplement like Mimi’s Miracle Minerals for an extra boost. Use these healthy packed lunch ideas to improve the quality of you and your family’s meals each day. Your body will be thanking you!